Part 16 of the Continuous Accounting blog series. You can access the full series here. In the previous blog, we introduced a maturity model to help you identify your current state. We also provided milestones to work toward as you implement a Continuous Accounting approach at your organization. Let’s explore this further, and add practical examples of process improvements that you can begin making today. The most successful process-evolution projects start with the basics. By breaking down a process into its smallest components, opportunities for continued automation and optimization surface organically. Let’s take account reconciliations as an example. 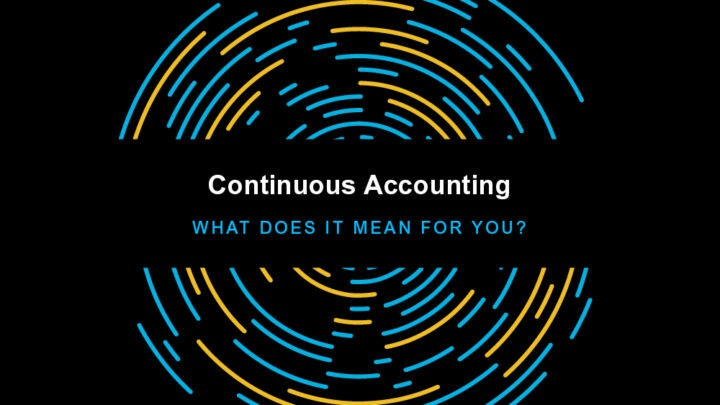 Organizations in the early stages of the Continuous Accounting maturity model likely tie out transactions and enter balances manually, completing their reconciliations on spreadsheets. They then print them out for manual review and sign-off, and store them in a binder. An obvious first step to improve the process would be to leverage software for account reconciliations. This helps streamline workflow and add some control while high-volumes of transactions are still manually matched and journal entries are created manually in the ERP. After achieving a quick win by adding workflow and utilizing templates, a logical next step to improving this process is to automate the detailed reconciliation of transactions from other sources to GL postings. Thousands of transactions are happening on a monthly basis, requiring significant manual effort to reconcile accounts and close the books. Transaction matching can be an especially frightful process full of rainbow spreadsheets and confusion. Automating these high-volume reconciliations not only saves time but also reduces risk and makes exception handling easier. Once an organization begins modernizing its record-to-report process by centralizing account reconciliations and automating transactions, the loop can be further closed by automating logic-based journal entries. This creates a comprehensive end-to-end process. By leveraging journals-management software, companies can unify entry creation and posting across disparate ERPs and systems. Teams can also ensure that correcting entries are always tied to the associated reconciliation and workflow is embedded. These solutions embed consistency and control into the creation of journals and maximize visibility to status and approvals. With your account reconciliations and journals automated, even historically resource-intensive processes like reconciling high-volume bank accounts can be run automatically and continuously, leaving only exception handling to the capable, nuanced intelligence of skilled accountants. Once this process—one of many—is automated and optimized, imagine extrapolating these results across all reconciliations, journal entries, and matching opportunities. This bottom-up approach allows organizations to methodically and continuously improve over time. As new technology is adopted, processes are improved, people are empowered, and the accounting organization realizes unprecedented agility that enables analysis and data-driven decision-making. More so than an implementation, however, Continuous Accounting is a mindset. This approach transforms the way accounting and finance work—collaboratively and proactively—by emphasizing real-time processing, talent development and utilization, and robust analysis. Top-performing companies with this mentality are closing faster, and according to The Hackett Group, have 90% greater automation, 46% lower audit fees, and 52% lower costs overall. Read this ebook to learn how to achieve similar results for your organization. Next story What Are Adjusting Journal Entries?